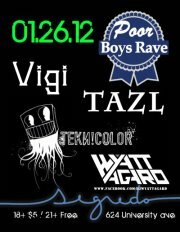 Clearly Good Music: Teknicolor at Segredo This Thursday! Hey MadFam. Do you know what I love more than parties and moombahton? When the party has moombahton. LOL, I'm such a dork. However, I am dorky for good reason and that reason is because the awesome and powerful slowed-down sound of Teknicolor is coming back to Madison. There are so many local names now in the moombahton game. Samroc, Von, Mad Major Melvin, Nexah, speak.EZ, Gnarizard, Wyatt, Kayjay, Digital T and others are dropping some ill moombahton and moombahcore, much of it, songs they made themselves. But somewhere on the top of that heap is Wausau's Teknicolor. And why, you might ask, am I going on like this? Because he is playing this week at Segredo's Poor Boys Rave! The PBR parties at Segredo have been off the heezy for a hot minute now and there is no reason to believe that will change anytime soon. As the Segredo venue continues to grow and refine it's presence in the EDM scene, PBR has been instrumental in allowing people who live near campus to be exposed to sounds that were sometimes only available at venues like Inferno. So this Thursday, not only do we get to hear all of Teknicolor's moomba-heat, we also have the boys from Appleton gracing the decks. Hot off a killer night in Appleton which featured none other than Bad Boy Bill, Vigi is doin' thangs like some of my favorite people like to say. And Tazl is Fox Valley famous. I lived there for many years and he's the good stuff in Boringsville. So get ready fam, this Thursday at Segredo is going to be dripping with EDM swag. Just like we like it here at Clearly Good Music.